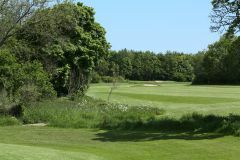 Located conveniently, very close to the A1, and with easy access into Newcastle, George Washington is the ideal place for a golf break in England's north-east. The course itself is a mature parkland layout, and is well-regarded, having been selected to host numerous regional professional events. Free bucket of beers for groups of 12+ in 2019! However, there is no need to be intimidated, as the variety of tees on offer makes the par-73 track playable for visiting golfers of all abilities. The inventive design has made full use of the natural hazards presented by the existing land, providing numerous obstacles for players to negotiate. Course management is the key around George Washington, where it is essential to position both tee and approach shots correctly to score well. Away from the fairways, there is a useful practice centre which includes putting and chipping greens, a driving range and a 9-hole par-3 course, ideal for honing the swing and sharpening the short game. The George Washington Hotel, Golf and Spa is set beautifully and peacefully amidst its own 200-acre estate. Boasting a fantastic range of modern facilities many of which have been recently refurbished, and within easy reach of the vibrant and lively City of Newcastle. There is a variety of room types among the 125 guest bedrooms, ranging from doubles, twins and triples through to executive suites. All rooms come with the expected amenities to ensure a comfortable stay, and the friendly staff are always on hand to help accommodate any wishes or requests. Visitors will also be impressed by the standard of the hotel's facilities, with a brand new restaurant Carter and Fitch, a very popular Smokehouse, Pizzeria and Bar, Abrahams lounge bar, and well-equipped leisure centre, Spa, Golf Shop, everything you might need for a great weekend of golf with your friends. The superb on-site leisure centre is fitted with a good-sized swimming pool, gym, steam room, sauna and Jacuzzi spa bath. There is also the chance to be pampered in our Montana Spa offering a great range of treatments including specialist sports massage to ease away the strain of the day. Eat in the stylish and comfortable atmosphere of Carter and Fitch, smokehouse, pizzeria and bar. We have a vast range of gins, whiskies and all the other usual suspects, along with a great range of beers and wines, no need to get a cab just stay at the resort and enjoy everything it has to offer, including friendly, welcoming and warm Geordie hospitality. The George Washington Hotel Golf and Spa, Newcastle was awarded its 4* status from the AA in 2016, it is rated as excellent by both the AA and many review sites.